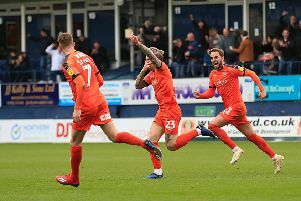 Hatters midfielder Arthur Read is starting to reap the benefits of some tough love from his more experienced team-mates at Kenilworth Road this season, according to boss Nathan Jones. The 19-year-old, who came through the ranks at Luton, was heralded as one to definitely watch earlier in his Town career, awarded a three year contract back in November 2016. However, he found first team opportunities limited, making just three substitute appearances, until catching the eye in pre-season this term, used regularly by Jones in the friendly matches. Since then he has gone on to make his first start for the club during the Checkatrade Trophy group stage win over Brighton U21s. He got a full 90 minutes that evening, following it up with another in the 3-0 win over MK Dons and is expected to start again this evening as Town head to Peterborough. In both matches, Read has shown clear signs he could turn out to be the player that starred in the club's academy, as on his progress, Jones said: “We’ve had high hopes for Ready for a long time, but they plateau sometimes and then they show a spike. “Ready has his plateau and now he’s coming again, he’s proving that he’s benefiting from training with us every single day and every single minute. “He’s well liked by the players. The players respect him because of the ability he’s got and they push him and are hard on him. “It’s done him the world of good as we’ve got good professionals here and they won’t allow him to take liberties in any way. “Being a young, talented player, you sometimes can take your foot off the gas. “Sometimes you can, when you’re having a good game, not concentrate, but with the people he has and especially someone like Sheez (Alan Sheehan), as he’s a bit of a mentor to him, he keeps on at him, and is probably doubly hard on him as he wants him to do well, as we all do. So the older pros do my job for me and do the coaches job for them in that kind of way, or help us.